OMEGA’s PCL819 combines a high performance handheld pressure calibrator with an integral electric pressure pump in a small, lightweight, handheld unit. Before this innovation, users had to manually generate pressure using cumbersome manual pumps or large, heavy boxes with limited portability and battery life. The PCL819 is only slightly larger than the PCL340 series and weighs in at a mere 1.2 kg (2.5 lb). The housing is easily contoured to fit a technicians hand with good balance top to bottom. The internal pump can generate vacuum or pressure from -12 to 300 psig. The PCL819 has an internal isolated pressure sensor with 0.025% of full scale accuracy and comes in three gauge and two absolute pressure ranges. It is also compatible with the PCL-PM series external pressure modules which come in ranges from 5 to 5000 psig and also differential, absolute and compound ranges. A PCL-PMA module adaptor is required to use external modules. In addition to pressure the unit also has an input for Pt100 RTD sensors for temperature and can measure and simulate 4 to 20 mA current loops. The large LCD graphic display can be configured to display up to 3 variables at the same time by the user. 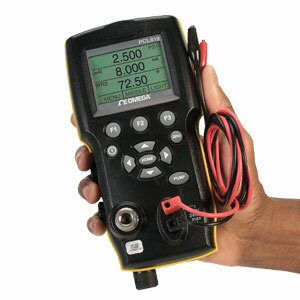 It provides a number of convenience features such as switch testing, percent error, and a damping function. Up to 5 frequently used configuration can be stored and retrieved with one button recall. 注: Comes complete with operator’s manual, 8 “AA” batteries, test leads, test hose, dirt trap, fittings, calibration certificate, and carrying case.